Laying a fake grass carpet on the terrace of this beautiful bedroom has given the space a whole new dimension. Four walls have been opened out to reveal a natural, serene and inviting outdoor space for morning café al fresco. 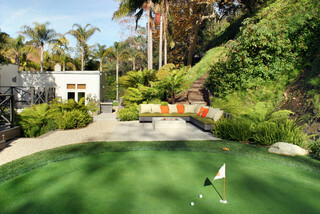 You could recreate this beautiful golfers garden and seating area. Enjoy your very own golf putting green and get in loads of extra practice. While friends wait their turn over a cool drink, comfortably seated at the lounge. 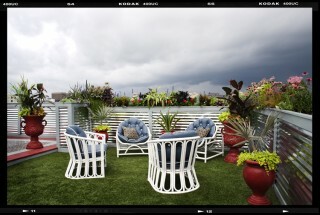 It doesn’t matter what the space, fake grass can transform your unattractive concrete area into a green oasis. The grass carpet, coupled with some brightly coloured planters and designer garden furniture, has made this roof sublime. You can get really creative by embedding paving stones into fake grass just like this inspirational design. Not only has this created an attractive feature, it’s ideal for a pool surround with no maintenance, and no mess. Creating this shady haven was made possible through the installation of artificial grass. A natural lawn would be muddy all these trees without any sunlight under. The space is made more inviting with curved bench seating and brightly coloured fabrics. Why have I got a moss lawn instead of grass? Moss is a non-flowering sponge-like plant that spreads like wild-fire in the right environment. In the UK, rainy weather in our sheltered back-gardens makes it a common problem. If you’ve more moss than grass, here are a few helpful hints. Mowing your lawn any shorter than 2.5cm (1in) can cause moss. Cutting too short weakens the grass, allowing moss to spread easily. You should keep grass blades longer, yet mow more regularly because it encourages the spread of grass plants. Moss thrives in damp conditions. The plant must have a damp environment to grow because it has it has no water-proofing systems to prevent its tissue water evaporating. It also needs surrounding water to reproduce. Try spiking to improve drainage. If you have shaded or sheltered areas that get little or no sun or wind to dry out the lawn, you’ll get problems. Try to cut back shrubs, hedges and trees to reduce shade. If your grass is unhealthy due to poor soil conditions, moss can take over. Treat your lawn, preferably with a product that contains moss killer. Ever thought about faking it? To maintain a neat, tidy, moss-free lawn takes a lot of work. If you have a North facing garden or very poor drainage, you may be fighting a losing battle. Have you ever considered artificial grass? You can finally have a beautiful lush green lawn, with no weeds, moss or patching. And there’s virtually no maintenance. Posted in Fake Grass, Landscaping Tips, Natural Turf Troubles | Comments Off on Why have I got a moss lawn instead of grass? Why waste 20 hours a year lawn mowing? If you mow your lawn for 1 hour per week from May-September, you waste 20 hours of free time a year. Lawn maintenance is time consuming. With an artificial lawn, you can forget about your grass for good, and give yourself back a hard-earned rest at the weekend. The little and often rule is the key to good grass care – but who has the time? Gardening experts recommend you should cut your grass at least once a week in Spring and Autumn, and twice weekly in the Summer months when it grows faster. You cannot cheat and clip short because this weakens the blades so moss and weeds take over. If you follow guidelines by the RHS, that’s actually 30 hours a year, assuming it takes you 1 hour to do the job. Then there’s the edge trimming, weed removal, patch repair and feeding to keep it looking tip top. As well as this, you’re spending money on electricity, water and fertilisers. It’s no wonder so many Brits faking it these days. Artificial lawns require very little maintenance – just a quick brush down once and a while to keep the fibres in good condition. Installing one could give you an extra day of free time per year – maybe even 2 days. Many people enjoy the fresh air and exercise they get from mowing the garden…but imagine how much more fun you could have instead – perhaps going for a walk in the park or kicking a ball around with the kids? Don’t waste your precious spare time, call us on 01371 87 5901 for a free fake lawn quote. Posted in Fake Grass, Landscaping Tips, Natural Turf Troubles | Comments Off on Why waste 20 hours a year lawn mowing? Keeping chickens in the back garden has become hugely popular in the UK. According to statistics 700,000 people now keep hens at home – numbers have risen by around 80 per cent in just a few years. This is thought to be due to increased awareness about intensive poultry farming after highly publicised campaigns spearheaded by Hugh Fearnley-Whittingstall and Jamie Oliver. Rearing your own hens is fun and you get to eat eggs like a king. Chickens are highly intelligent and don’t like to be cooped-up – so they need a nice big run to stay happy and healthy. Healthy hens cost less to keep, and produce more eggs. 10-12 square feet of outside space per bird is considered minimum, but it’s recommended to give them as much space as you can. Unfortunately, this can be extremely detrimental to your lawn. The biggest problem is mud. A few hens can devastate natural grass garden inside a few weeks – it simply isn’t tough enough to withstand the daily activities of poultry. It is quickly worn down and turns to a mud bath when it rains – so many owners are turning to artificial grass to solve the problem. Artificial grass is tough enough to withstand free-roaming, scratching and pecking, providing a safe and superior living environment for hens. With the added advantage it can be cleaned hygienically with a garden hose. It’s even being used in poultry farming. Animal-friendly, agriculture innovators Rondeel, use astro-turf in their state of the art system, used in poultry houses in the Netherlands. Their studies have shown that hens don’t care whether the grass is real or not; they behave very naturally on artificial grass. What could you create with fake grass? A concrete storage area, between classrooms at a primary school in Cornwall has been transformed into a fairy-tale garden with fake grass. Nansloe school has just received an award for the inspiring project which has created a magical storytelling garden for pupils. Brightly painted double doors from the playground set the scene, bearing the words “one upon a time.” The area features a hobbit house, wooden reading tower, mushroom seating area, castle-themed stage, and faux-pond complete with crocodile and bridge. It is entirely carpeted in fake grass and covered by a glass canopy, with lighting and a sound-system. Designed as place where children can immerse themselves in stories, there’s a throne, mini pirate ship and even costumes so they act out their favourites on the stage. Teachers use the cosy house inspired by J R Tolkien to read to pupils at story time. Older kids are encouraged to read independently in the fort or at the fairy area. On world book day, the garden was decorated as a winter wonderland – while children dressed up as characters from C S Lewis classic Narnia series. The project has captured the hearts and minds of the community. A great example of what you can do with a big imagination and a little fake grass. When you think of fake grass, images of green grocer type mats in your local convenience store may come to mind. This is not how modern grass products look. These days fake lawns are almost undistinguishable from the real thing. Advances in technology means grass has evolved, machinery creates products with multiple types of fibres, with different textures and colours. So, it’s ultra-realistic and even feels real under foot. The debate as to whether producing plastic grass creates more carbon emissions than maintaining natural grass has been going on for decades. Some evidence has highlighted concerns about production, but today most manufacturers use recyclable materials. Other research has found that natural grass maintenance has a far greater environmental impact. E.g. the EPA calculated that Americans use 800 million gallons of fuel per year in petrol-powered lawn mowers. This is not true. Grass carpet has millions of tiny little holes that allow water to flow freely. This is installed on a base of crushed hard-core to allow water to continue its journey into the soil. It can actually enhance drainage, make rain water disappear faster, and prevent your lawn from getting water-logged. Issues only occur when products are not installed correctly. While many companies will have you believe that fitting is a piece of cake…it isn’t. It is a skilled landscaping job, and requires the correct materials. If you’re not very experienced, it’s much better to get a professional fitter. You’ll probably find there’s not much difference in price when you account for all the equipment you’d have to buy. If you are an experienced DIYer, you may be up to the challenge but before you leap, make sure you get accurate advice about the process. Buying the right materials is critical, the type of sand you use is important because some varieties can lead blockages and drainage problems.